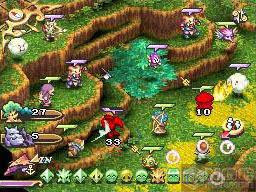 One of the gazillion games I'm looking forward to playing on my DS is Square's Heroes of Mana. That decision is based solely on the few screen shots I've seen of the game, however. Well, those days are over now as a brief trailer for the game has hit the Internet for all our viewing pleasure (http://www.gamebrink.com/nintendo-ds/2313-Heroes_of_Mana-video-2.html). Just a tiny bit of gameplay is included, but it should certainly be enough to whet your appetite for more.